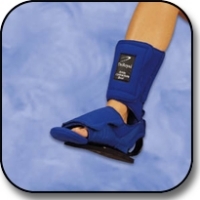 The Ankle Contracture Boot is a static ankle foot orthosis used for positioning, pressure reduction, and may be used for minimal ambulation. No strap closures make it easy for the patient to apply and remove. Softgoods completely cover the splint, leaving no exposed metal. Available in Fleece or Vel-Foam, with anti-rotation bar, padded toe piece and mesh laundry bag. Available with or without boot sole. Universal left or right. Accessories: Hip abduction bar bootsole and extra softgoods. Patent pending. Indications: Hip rotation and drop foot. Not recommended for severe plantar flexion contractures, open wounds, severe spasticity or thrombosis. B = 10in. to 14in. C = 14in. to 16in. D = 16in. to 21in. B = 7in. to 9in. C = 9in. to 11in. D = 11in. to 13in.